We’re excited about the most colourful time of year in the Wells Gray area! While the early mornings and evenings are autumn-crisp, and the sun diffuses its warmer seasonal glow, the weather is still temperate enough to be lovely around Alpine Meadows. The rivers are no longer raging, and the rush of visitors has also quieted, leaving autumnal explorer with a sense of having the park to themselves. Wells Gray Park holds a lot of secrets in the fall! Which makes it the perfect time to explore. The North Thompson boasts an inspiring mix of evergreen and deciduous trees, providing a breathtaking palette of colour! Bursts of gold, red and fuschia punctuate the swaths of green mountainside. Old-growth fir and red cedar mingle with the younger birch and cottonwoods, creating a pop-art quilt across the valley. In an outdoor playground like this, there are countless ways to catch the fall colours in Wells Gray Park. An easy hike brings you to the viewing platform over the Clearwater River. It’s not the largest of the falls, but it is nonetheless spectacular and easily accessible. This time of year, the salmon run is in full swing; it’s mesmerizing to watch the determination (and remarkable gymnastics) of the fish as they complete this ancient, instinctual event. 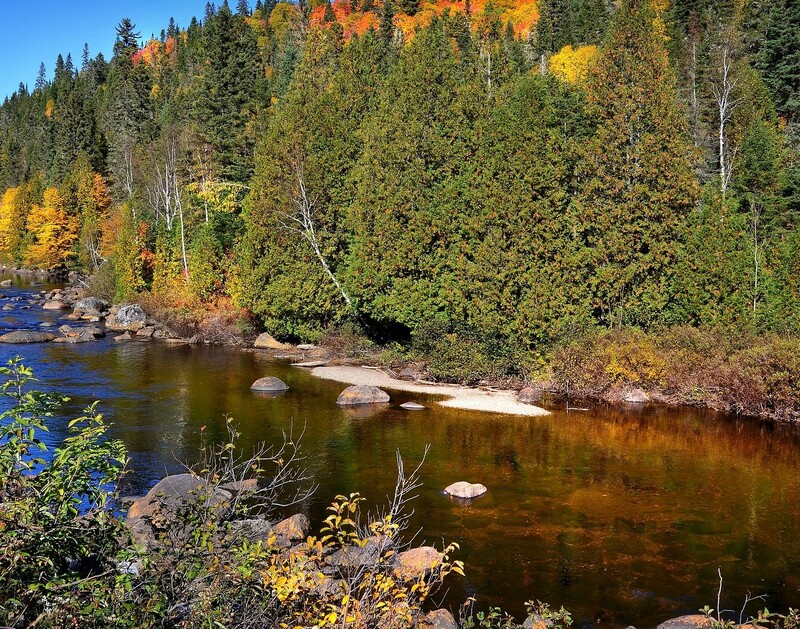 The fall colour palette is on display to everyone, even if hiking is not your style. A leisurely drive along the Wells Gray Corridor (Clearwater Valley Road) will reveal the yellow-gold of the changing birch leaves as they peek through the dense evergreens. Roadside shrubs offer hot pink leafy surprises. End-of season wildflowers introduce speckles of orange and warm white. Catch glimpses of the wildlife snacking on the berries of the bright red chokecherry trees. View the fall colour show from on high! Horse owners can ride the beautiful and extensive Flat Iron network of trails without written permission. No horse of your own? Several local companies offer trail rides through the park. Riders of all levels can take guided tours past various lakes and falls, learning about the environmental, geological, and human history of the area. Plan to paddle on these sister lakes and soak in the sights of the season from the calm waters. The shorelines of both Clearwater and Azure are full of richly-hued foliage and local wildlife, and the overwhelming feeling here is one of quiet. There’s something inspiring about watching the turning of the seasons as you rock gently in a boat. Kayakers and canoers recommend the portage route between the two lakes, and local outfitters offer a variety of boat tours. Experience the changing colours as the Ray family did a century ago: against the photograph-worthy backdrop of this historic farm. A short hike in from the Corridor will lead you to the ruins of the Ray Farm, a homestead built by John and Alice Ray in the 1920s. Extend your hike further, to Alice Creek and the mineral springs. Wildlife frequent this series of trails at dawn and dusk as they prepare for the colder winter weather. The Green Mountain Road trail network, popular with mountain bikers, also offers stimulating views of the changing foliage in the surrounding brush and leafy canopy. Steep descents through rich rainforest pathways are accentuated by the glimpses of bright golden colour. (We do recommend you keep your eyes on the trail while you’re actually moving, though!). Get a birds’-eye view of the myriad of chromatics, here! Look down upon the brilliant carpet of gold and green on a tandem paragliding tour. We’re not sure what is more exhilarating, seeing Wells Gray awash in colour, or soaring through the skies. The banks of this beautiful waterway are lined with cottonwoods and scrub that boast the most magnificent hues of the season. A scenic rafting tour (suitable for all ages) is the perfect way to experience the splendour. Several rafting companies offer trips down this gentle stretch –no need to concentrate on the rapids, here; you can take your time enjoying Mother Nature’s display. Autumn here is nothing short of a spectacle. Wells Gray is wrapped in colour as the weather starts to turn. The leaves put on one last great show, and they’re complemented by the shimmering waters of the river, the bold red salmon, and the cozy brown fur of the not-quite-ready-to-hibernate bears. Be prepared for a kaleidoscope when you visit Alpine Meadows this fall. Pack your binoculars, a pair of sturdy hiking boots, and a jacket –you’re going to be outside for a while! We guarantee that you’ll find it hard to pull yourself away from the enchanting fall colours throughout Wells Gray Park. Keen to see more than the changing colours? Read Autumn in Wells Gray Park, or contact us to learn more.